First off, I have to give a big 'THANK YOU!' to a wonderful reader named Louise who gifted me this book, which I immediately read, even if it has taken me awhile to get a review out, lol. Louise, thank you so much! I really appreciate your kindness and generosity; this title is now quite at home within my paranormal library. 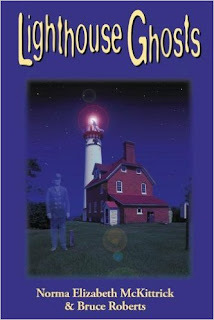 And, its a welcomed addition for good reason---who doesn't love a haunted lighthouse tale! I swear, I think just about every single lighthouse in the nation has at least one ghost story attached to it. The authors include a wonderful introduction explaining the historical dedication that lighthouse keepers had for their occupation, and the dangers associated with such work, both huge factors in why many believe the majority of these structures continue to have that haunted reputation today. 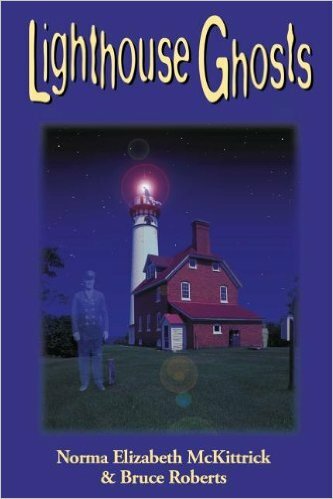 While there are many haunted lighthouses out there, this book focuses on thirteen of the strongest, most documented tales, including the lighthouse at St. Augustine, Florida and at Heceta Head, Oregon, which I posted about last year. Both the Pacific and Atlantic coasts are represented, as well as several selections from the Great Lakes. Each chapter focuses on a different lighthouse, its history, its hauntings, and some brief information on when and how to visit the lighthouse property for yourself. Since the book was published in 1999, there are VERY few websites included for more information, but each chapter does have a beautiful black and white photograph of the lighthouse in question, which makes up for it! I really enjoyed this book! It's a relatively short book at only 119 pages, but its packed with legends, recent (well, recent as of 1999) experiences, and history. There's just enough of history and hauntings to give the reader a nice overview without being too tedious and straying too far off topic. Combined with the length, the large font makes this a really quick read, and also a perfect read for a younger paranormal enthusiast...or someone like me with a rather short attention span. I pretty much read this one straight through one evening, but the format is perfect for those who just want a quick story or two at a time. With such a huge geographical range covered, despite the rather niche topic of lighthouses only, I highly recommend this book for anyone who loves a good ghost story, or who loves the unique history of our nation's coastal safety. Pick up a copy today and tell me what YOU think of it, or head over to Theresa's Haunted History's Facebook and let me know about YOUR favorite haunted lighthouse! Fun Fact: Did you know that landlocked West Virginia has its own lighthouse? It's not a real, operational lighthouse, but a recycled wind turbine. You can visit and tour the structure at Summersville Lake!